BACKGROUND - Xotic Wah is modeled based on the Holy Grail, 1967-1968 Italian-built Clyde McCoy Wahs. With the Xotic Wah you don’t get one or three sounds in one pedal, you get unlimited sounds with unique controls that shape and contour your sound the way you hear it! 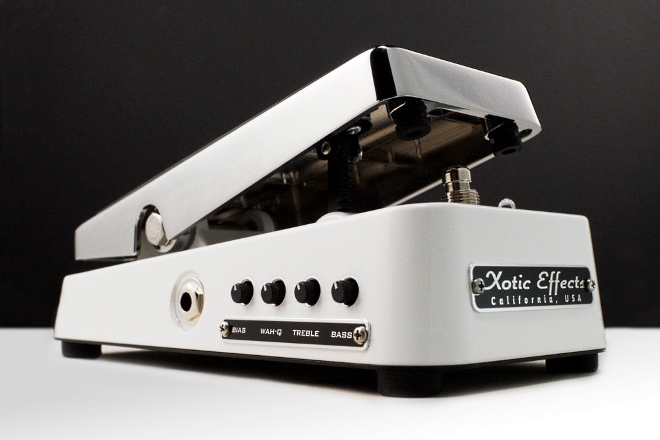 The adjustability and flexibility of the Xotic Wah makes this one of the most versatile wah available today! BIAS CONTROL — Changing the bias warmer will lead the Xotic Wah to having slightly more output & firm up bass frequencies along with a more pronounced wah through the sweep. A cold bias is common with vintage wah pedals for a very clear voice that is more transparent in tone and smoother in operation. DC JACK — 2.1mm x 5.5mm 9VDC — Negative Center. When an external power supply is used, the battery is disconnected from the circuit. When using a battery, the life of the battery can be extended if you unplug the input when the effect is not in use for long periods of time. Battery access is through the removal of bottom plate.